The United States Congress designated the Teton Wilderness (map) in 1964 and it now has a total of 584,706 acres. All of this wilderness is located in Wyoming and is managed by the Forest Service. The Teton Wilderness is bordered by the Washakie Wilderness to the east. The state's second largest Wilderness area straddles the Continental Divide deep in the heart of Wyoming's Yellowstone Ecosystem. It is bordered on the north by Yellowstone National Park, on the east by Washakie Wilderness, on the west by Grand Teton National Park, and on the south by the Mt Leidy Highlands and Gros Ventre Wilderness. To the west of the Great Divide the land is dominated by timbered ridges, grassy slopes, and broad willow and sedge meadows with elevations from 7,000 feet to 9,675 feet. To the east of the Great Divide are high alpine plateaus broken by ridges and extensive mountain meadows with elevations from 8,000 feet to 12,165 feet (Younts Peak). On Two Ocean Pass, the famous Two Ocean Creek splits to send water to both the Atlantic and the Pacific Oceans. Within the Teton Wilderness the headwaters of the notable Yellowstone and Snake Rivers arise in alpine meadows of willow and sedge. You'll see evidence of the great fires from the summer of 1988 that burned here and in Yellowstone. In 1987 the highest elevation tornado ever recorded mowed a 20-mile-long, two-mile-wide swath through an area near Enos Lake. But in general, this area is vast, spectacular, and relatively unspoiled. Teton Wilderness ranks among this nation's best wildlife areas. Summer brings trumpeter swans, sandhill cranes, ducks, geese, falcons, and song birds. Grizzly bears, grey wolves, moose and elk wander across meadows. Golden and bald eagles, hawks, grouse, coyotes, beavers, martens, bobcats, porcupines, otters, and mink live here year-round. Approximately 450 miles of trails provide access to this popular area. About half of the visitors to this area come expressly to hunt and fish. Home to numerous large predators, Grizzly and Black Bears, Grey Wolves, and Mountain Lion, it is strongly recommend that all visitors take precautions and come prepared to recreate accordingly. 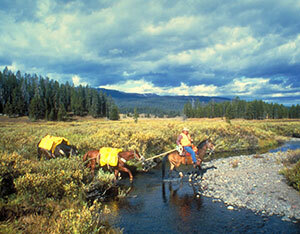 Planning to Visit the Teton Wilderness? How to follow the seven standard Leave No Trace principles differs in different parts of the country (desert vs. Rocky Mountains). Click on any of the principles listed below to learn more about how they apply in the Teton Wilderness.